The Potter and the Clay: My Birthday... is it 29, 39, or 49?! What difference does it make? February 12 was when I, the fourth daughter of Henry and Tina Reimer was born (notice I didn't mention the year?) I came after their only son who was born in 1950. That sort of gives it away! We had a delicious gourmet dinner of AFRICAN ADOBO-RUBBED TUNA on Saturday for my bithday, while Kara was still here....Gloria had arrived and Renee had just got out of the hospital. She walked all the way to the apartment. Every day I am thankful that we got this place so close to the hospital. I had thought maybe we could just order in some food...but when I saw that recipe...Renee and Kara planned the menu...I knew we could not order in anythng that would even compare to this gourmet dish. I really appreciated that Kara wanted to bake a Cocont Rum Cake for me, but it just didn't work out this time. So we decided on Banana Split with Gingered Chocolate-Coconut Sauce with Ben & Jerry's Cherry Garcia Ice Cream for dessert instead of the cake. 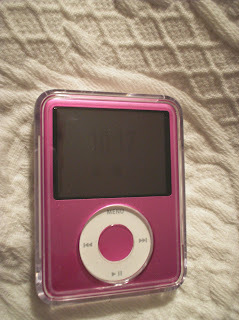 Renee convinced Ray to give me an iPod for my birthday. It arrived this morning, so Ray had the joy of actually giving it to me! He left right after all that excitement, and took off with the key again! But this time I thought about it right way... he was only half a block away! Renee is still having quite a bit of pain, and some nausea. Her recovery from the surgery was faster than expected, which was a little bit of something positive in the midst of all the suffering. Further details of the treatment plans can be found in Ray's blog.